BACKGROUND: Gastroesophageal reflux disease (GERD) is a common condition in communities in the United States, but treatment options are limited for patients with inadequately controlled symptoms despite high doses of proton-pump inhibitors (PPIs) and who are afraid of surgery. 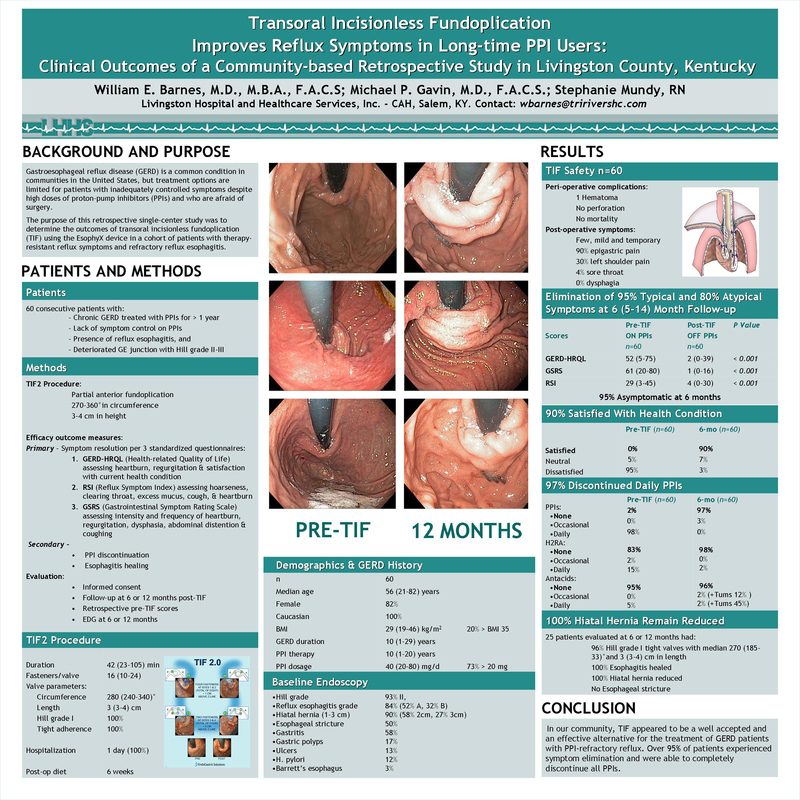 AIM: To determine the outcomes of transoral incisionless fundoplication (TIF) using the EsophyX device in a cohort of patients with therapy-resistant reflux symptoms and refractory reflux esophagitis. PATIENTS AND METHODS: Sixty patients underwent TIF at our critical access hospital between November 2008 and August 2009. Indications for TIF were failure of conservative treatment to control symptoms and persistence of reflux esophagitis despite a long-term use of high-dose PPI therapy. White women (85%) and men with 35-76 years of age (median 55) and suffering from GERD for 12 years on average (± 6 SD) were evaluated by repeated esophagoscopy and clinical examination. RESULTS: All procedures were completed successfully, except one that was interrupted because of a hematoma that was secondary to a long-time anticoagulant therapy. Mean operation time was 40 minutes (range 23-100). A postoperative endoscopy revealed a posterior partial fundoplication with 240-300° and 3-4 cm above the Z-line in all cases. A retrospective follow-up at 6 or 12 months is underway and consists of symptom score evaluation (GERD-HRQL, GSRS, RSI). Based on the regular clinical follow-up and available data TIF resulted in symptom resolution and PPI discontinuation in all but three patients. CONCLUSIONS: In our community, TIF appears to be a well accepted and effective alternative for the treatment of PPI-refractory reflux.